This novel study BUNDLE for JM Barrie's "Peter Pan" comes with a no-print discussion guide, student journal, and test. 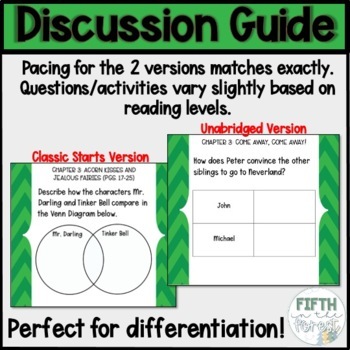 Students will practice a variety of reading skills including characterization, compare/contrast, sequence of events, setting, theme, figurative language, inference, and prediction. 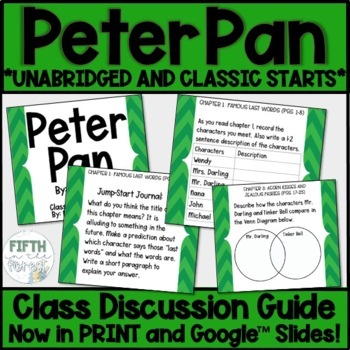 This is a full discussion guide for JM Barrie's "Peter Pan." Easy to follow and NO PREP!! The full study allows students to practice a variety of reading skills including characterization, compare/contrast, sequence of events, setting, theme, figurative language, inference, and prediction. 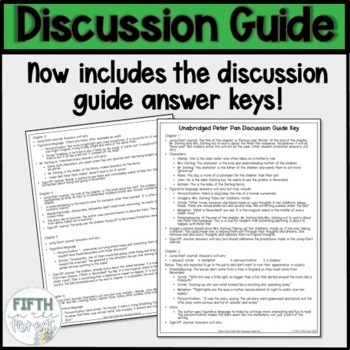 The best part about the discussion guide is there is NO PRINTING involved. Save your copier allowance by simply displaying this on the screen and allowing students to take their own notes! You will receive the same product in 3 different file formats: SMART, PowerPoint, and PDF. Each chapter will take around 40 minutes to complete, thus you receive at least 17 days of lesson plans!! By following this study, students practice a variety of reading skills including characterization, imagery, compare/contrast, sequence of events, setting, theme, figurative language, inference, and prediction. 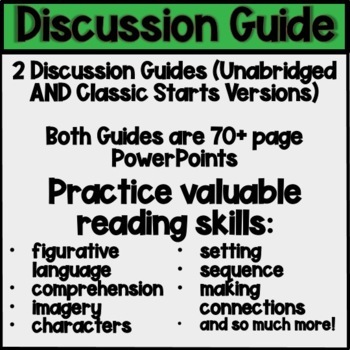 I used it at the end of the year to review reading concepts--super helpful for my class! The novel version I used is from the "Classic Starts" series by Sterling Publishing. It is retold by Tania Zamorsky. You will see that all chapter names and page numbers will follow this version exactly. But you can easily change the page numbers to fit the version of Peter Pan you use. Like what you see? Try out the free sample of this unit below! Peter Pan Novel Study—Chpts. 1-2 Free Sample! OR check out these versions of my Peter Pan products! Peter Pan Novel Study BUNDLE!